Students became teachers and teachers became students as the largest contingent ever of Wabash men participated in the Celebration of Student Research, Scholarship, and Creative Work. Every spring semester, on the last Friday of January, formal afternoon classes are cancelled and Detchon Hall is transformed into a Mecca of teaching from all disciplines across the campus. The Celebration is an opportunity for students to present their original, intellectual work much of which is collected outside the normal semester coursework. This year 86 students participated in the 8th Annual Celebration. See photo albums from the Celebration here and here. Juan Carlos Venis ’09 shared his research titled "HealthMap.org: Multi-Lingual Input for Improved Disease Outbreak Detection." The research was completed last summer as part of a bioinformatics program at MIT-Harvard HST in Cambridge. "This was a good opportunity for me to practice presenting this research. It is only the second time I have done it," he said. "I also wanted to be able to share with my professors and mentors at Wabash what I had been doing over the summer." Stephen Prunier ’09 was also anxious to be part of the event with his poster titled "Synthesizing L-Prolinol Derivative to Catalyze Asymmetric Epoxidation Reactions" (along with Andrew Hasty, Forrest Craig, Steven J.R. Miller, Jay Brouwer, and Filip Drambarean). "I put a lot of work in to this research spending two or three days in the lab for five weeks. This is new research that has not been done with this particular molecule." The range of topics was as divergent as any group of Wabash men. Greg Slisz ’10 had a unique psychology project. He took a critical look at Maxim magazine and it’s marketing approach to young men. He noted how the magazine often portrayed male stereotypes and trivialized women. It was a unique way to learn, Slisz said. "I learned a lot about research," he said. "I did a sizeable amount of or research at the library's data base for publications. I also had to look at the magazine critically." While Detchon Center was filled with students buzzing about their research projects, it was packed with even more students, faculty, community members, and trustees who were eager to see what the students had to share. Wesley Ault ’10 was enjoying the afternoon away from classes yet still taking the opportunity to learn about his fellow classmates. "I had five or six friends here that I wanted to support," said Ault. "But there were also a couple presentations that I really wanted to hear. It’s good to see what kind of research students are doing in the classroom and in their free time." 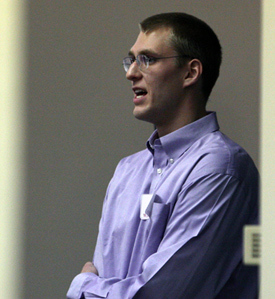 Although Andrew Hoffman ’10 was there with an assignment for his C&T class he found the event to be inspiring. "I had started some research but it has gone by the wayside. This has inspired me to start that back up again and has given me ideas of things to do in the future with professors," he said. "The faculty are really willing to collaborate with the students even though it is not required for the students to do the extra research. There is so much research going on at the undergraduate level at Wabash. I think that makes it a really unique place." 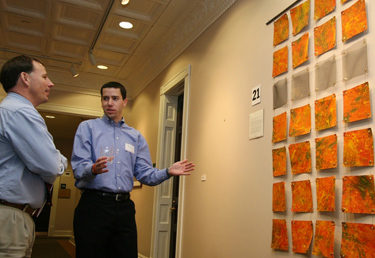 In photos: Top left, Steve Miller talks with Professor Scott Feller about his artwork. At lower right, Greg Slisz discusses Maxim Magazine.